Oooo ... this sounds yummy Joan! Thanks for sharing!! Ymmmmy...sounds perfect for my small stampin' get-together in mid-January. I'll add a salad and I can forget it until it's done. Sounds like I could refrigerate once assembled and then pop into the oven close to lunchtime. Thanks Joan. 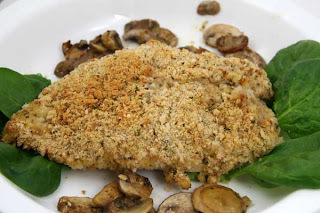 This sounds a lot like a chicken I make, but my boys call it wine Chicken, and when you have panfried the chicken pieces like in your recipe, then just saute the mushrooms in 1/3 cup white wine, and then pour all over the chicken and finish them in the oven for 20 minutes. In the last 5 minutes, sprinkle shredded pizza cheese over the whole thing til hot and bubbly! Wonderful. Oh boy - that sure looks good. I am going to have a go at making it. Thanks Joan. Thank you for the chicken recipe! Sounds like an easy and delicious dish! I will try it soon! Joan!! How are you??? I hope you had a fabulous Christmas and New Year's.. I haven't heard from you in awhile! !